We have all heard the stories. The tragic cases of kids being bullied, many of them taking their lives from being tormented by their peers for being viewed as different. I find it heartbreaking and distressing that these bullies- these kids- have lost the ability to feel compassion and the awareness that their words have consequences. I want to talk about a special girl and a special high school in Tupelo, MS that is dispelling all the stories in the media today. Amanda Aldridge is a beautiful seventeen year old girl who happens to have Downs Syndrome. She attends Tupelo High School where she is the manager of the girls basketball team (to whom she is frequently referred to as "Coach Aldridge" and gives the pep talks before the game), a member of the thesbian theater group and the fellowship of Christian Athletes. She has loads of friends, not because they are patronizing, but because they see her as one of their peers- and they cannot deny her sweet spirit that is contagious to all who come in contact with her. Tupelo High School has a student body of over 2000 students who are responsible for voting for the Homecoming Court maids. Once Amanda was nominated, the students started campaigning for her, many of those being the girls who were willing to give up their own seat so she could be the Homecoming Queen. 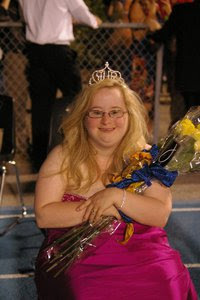 When the day finally arrived, Amanda was voted by the students of Tupelo High School to be the 2010 Homecoming Queen. When she found out, her mother told me she looked at her and said, "See mom, I told you I was going to win!" The support didn't end there. That morning, Amanda received a bouquet of flowers from two other senior maids who were nominated and when she arrived at school, the basketball team threw her a surprise party that said, "Amanda is our Queen." And as for Amanda, she hasn't stopped smiling since. And so when all of the news stories talk about the doom and gloom of the world, with all the negativity that makes headlines day in and day out, I wanted to shine a light on something that was worth being told- that in it's truest form, the human spirit is a wonderous beauty and has the capacity to love regardless of any differences we may have. And just like Amanda, that is something that deserves honor. The Queen herself, looking beautiful as ever. Thanks for sharing this story. Makes me proud to call Tupelo home.